By now you’ve heard from many corners of the Internet about Gap’s failed rebranding effort, their response, and eventual recanting. Large corporate rebrandings, their challenges, and failures are nothing new. But the particular way in which Gap presented, backpedaled and reversed leaves our heads spinning. The drama has played out in the blogosphere, on Facebook and in the media. Hopefully Gap has learned something and closed what seems to be a (pardon the pun) gap in the understanding of their own brand. Stand behind your designs and your creative firm. 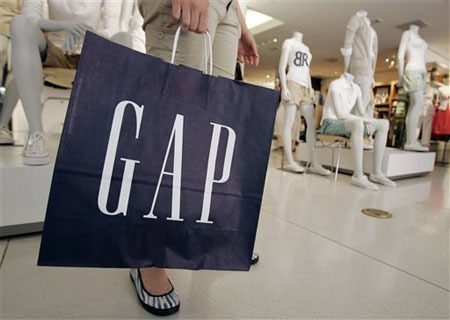 Other than lackluster execution, most of the problems were caused by Gap’s handling of the logo. From an outside perspective, it smacked of an organization not fully supporting a new design. The logo debuted online with little of the usual press releases and fanfare. Regardless of whether this was a social media experiment or just cold feet on Gap’s part, it gave off an uncertain impression that the new logo wasn’t able to shake. As soon as negative reaction sparked online, Gap was quick to backtrack, suggesting that “sharing of other ideas” was always part of this logo’s launch (it wasn’t — this effort was a fully-baked design). When that didn’t fly, and criticism grew, Gap ultimately scrapped the (presumably expensive) end result. This waffling and morphing of the company line made the change feel even worse. Gap seemed to shrink back from all the negative feedback and left their design agency, Laird & Partners, twisting in the wind. Instead of some justification or explanation why the new identity was on-target, we heard crickets chirping. A well-crafted positioning statement and explanation of the change would have shown support for the design, and ultimately, the firm who created the mark. Instead, Gap’s stance left Laird in an awkward place, unable to defend the work that was approved and commissioned by its client. After all, Gap’s internal team signed off on the logo themselves. The work might have been a brand misstep, but all parties are responsible. The quick way Gap washed its hands of the logo leads us to wonder if there really was true internal support for the change within the company. Or maybe it’s just the sign of a fearful executive team, unwilling to commit to a path and stick to it. A brave and committed client who brings something new into the marketplace often has to ride out the first waves of criticism, and Gap seemed unwilling to do so. This spells failure for any project, design or otherwise. And in an environment like that, bold identity and design work doesn’t have a chance of being born. Familiarity is not the same thing as brand equity. Henry Ford’s “faster horses” quote comes to mind here. Consumers don’t always know what they want (see also iPod, the Internet, etc.) and often fear the unfamiliar. So brands need to discriminate between inertia and actual brand love. A lack of willingness to change doesn’t mean that the new thing is automatically bad (though in this case, the Gap logo seems to be quite flawed) because people are comfortable with what they know. Maybe customers knee-deep in a recession didn’t respond well to big changes in their comfortable, mass-market brand. Many established brands have reinvented themselves with positive results, and Gap has the challenge of figuring out which step in this process was the wrong one. From our vantage point, it seems that the Gap logo reaction is less about the mark itself, and more about how Gap customers see themselves. They aren’t embracing a cold, Swiss-style type treatment and minimal color. Given a choice, they cling to a logo that has associations of Christmas shopping bags in the mall, college-era hangtags, and middle-class, reasonably-priced clothing. On the Internet, people hate things. Twitter and Facebook have become avenues for brands to get a better sense of what their audiences are thinking and saying, and this is a valuable resource to mine. But it’s important to note that the Internet also fosters a unique kind of snarky, “hater” behavior that doesn’t mirror real-life reactions. Scenarios such as this one cater to negativity, piling on, one-liners, spoofs, and a bastion of meaningful feedback like “I HATE the Gap logo!” Brand managers and executives need to have the wisdom to know the difference and intestinal fortitude to embrace the results. Crowdsourcing is still a dirty word. This statement only made matters worse, and was a thinly-veiled attempt to backtrack on the new logo’s prominence, leaving Gap with egg on their face. This looked like the poorly-conceived spin doctoring that it was, and didn’t jive with the Gap brand or its existing strategic plan. The only thing the design community hates worse than poorly-executed work is poorly-executed free work. In a moment where Gap’s design acumen was questioned, this abandoned idea only raised the hackles of brand designers who might be more understanding about how difficult this process is. Sometimes bad is just bad. It’s easy to Monday Morning Quarterback logo designs, but it seems pretty clear that the new Gap logo was a flawed effort. Its derivative use of Helvetica, and the casual tossing away of its brand equity both seem wrong for the company. We may never see what else Laird & Partners presented to Gap, but ultimately the mark seems to strike a false note, and moves the brand in the wrong directions strategically and creatively. Maybe this blowup can serve as a wakeup call for Gap, highlighting the fact that established brands aren’t often built to chase after tired trends. In the end, if all Gap gains from this costly exercise is better understanding of its logo’s strength and emotional currency, then maybe it was worth it. I have been following the Gap logo debacle through Zeroside and I appreciate the fairness of your assessment. It gives critique without being snarky. Nice! What an awkward situation for Gap to put themselves and Laird in – what seems to be lacking is confident leadership and confidence in partners. Thanks again! Thanks Tim for this thoughtful piece. It does seem like there was a lack of real commitment from the company to the new logo. A new logo launch often signifies deeper change happening in a business and it is used to open up conversations to that end. Whatever you think of the logo the overall strategy failed. I have been thinking about how this will affect Laird and Partners in the long term. As you mention it must be very difficult for them right now as they are probably bound by Gap to remain tight lipped. I believe the issue in the end goes beyond the emotional currency of the mark alone.